You’ve heard the Federal Reserve mentioned in the news, but do you really know what the central bank does? If you said “no”, you aren’t alone. The U.S. Federal Reserve is one of the most powerful financial institutions in the entire world and creates policies that influence the American (and world) economy. Politicians on both sides of the aisle have a long history of criticizing the Fed. Many call out that it lacks transparency and accountability, and that the highly influential officials in its branches are appointed rather than elected. For the public, polls have suggested that people don’t know what it is and distrust it, while others suggest Americans generally support the institution. Confused? We don’t blame you. Keep reading to learn more about the Federal Reserve and the role it plays in American politics. Critics who say that the Fed lacks transparency can point to the origins of the Fed as proof. After the financial crisis of 1907 a secret meeting took place at Jekyll Island, Georgia. It happened in 1910 and the six men present drafted a plan to rework the United States banking system. They were concerned about the financial system, and saw a need for reform. Over the next few years, plans were developed and eventually presented to Congress. In 1913, the Federal Reserve Act was passed and signed into law by President Wilson. Today, the Federal Reserve oversees 12 Reserve Branches, which are located throughout the country. The Fed came in very handy during the 2008 financial crisis, lending money to some financial institutions to pull them through or to purchase others that were on the brink of failure. It's no coincidence the banks more than quadrupled the amount of assets held in reserve at the Fed since 2007. Back in 2007, the assets held at the Federal Reserve totaled $922 billion. Just one year later, in 2008, the total assets had been more than doubled to $2.239 trillion. Between 2012 and 2013 alone, the total assets in the possession of the Federal Reserve jumped 37% from $2.917 trillion to $4.023 trillion. At the end of 2017, the Fed's assets totaled $4.448 trillion. Considering the entire U.S. GDP was $19.39 trillion in 2017, that's a staggering amount of money for a central bank to control (even for the world's biggest economy!). The Fed doesn't print currency – that's the job of the United States Department of the Treasury. The Fed does, however, manage the supply of U.S. dollars in circulation both in the form of hard currency (bills and coins) and available credit from banks. With so much control over how much money is available for people and companies to borrow and spend, the Fed influences everything from borrowing and investing to overall economic growth. Interestingly, although there has been a huge and rapid increase in how much money the Fed holds as assets in its reserves, over the past decade the increase in the amount of currency in circulation has increased much more gradually. In 2007, the total U.S. currency in circulation was $829 billion. By 2010, currency had surpassed the trillion-dollar mark for the first time, hitting $1.020 trillion. 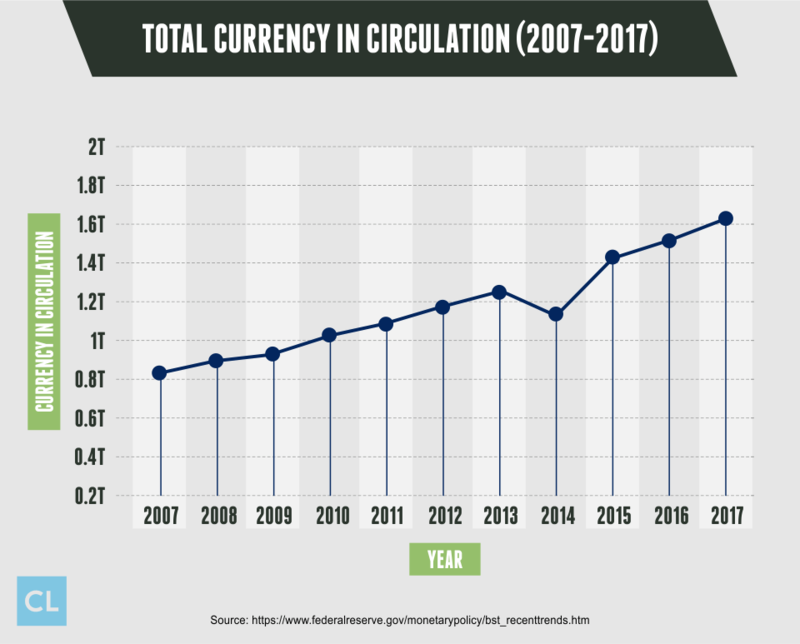 In 2017, currency in circulation had increased to just $1.616 trillion – nearly double what had been in circulation ten years earlier. Another factor influencing the growth in the total assets being controlled by the Federal Reserve has been an increase in the amount of deposits other banks have placed in the Fed as backup. This created a higher available reserve balance for the Fed in the era after the financial crisis of 2008. 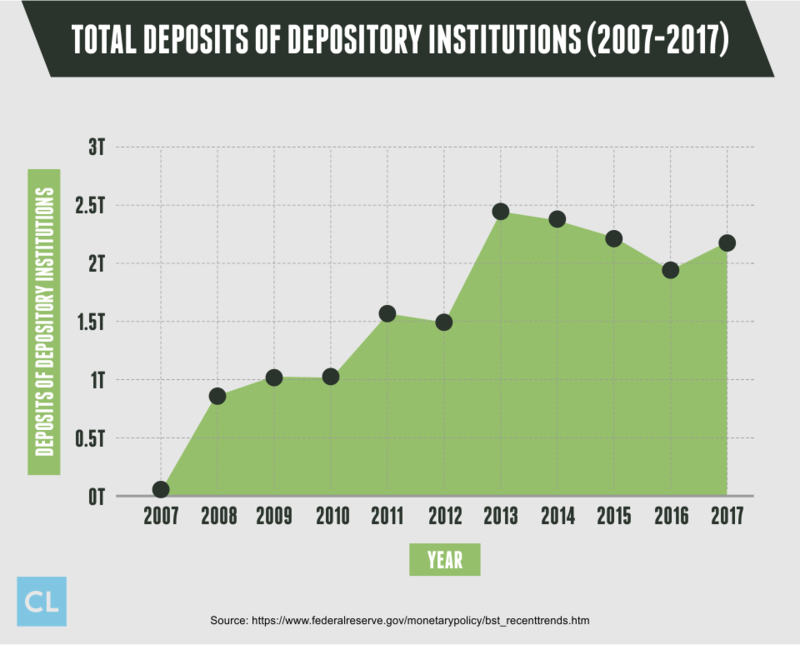 In fact, back in 2007, the total deposits of depository institutions (banks and other financial corporations) was only around $17 billion. By the end of 2008, the amount of money other institutions had placed under the control of the Fed had jumped by more than fifty times the 2007 amount to $860 billion. Then in 2013, it hit a peak, closing the year off with $2.45 trillion in funds deposited by other financial institutions. By 2017, the total deposits of depository institutions being banked with the Fed was down slightly to $2.208 trillion. 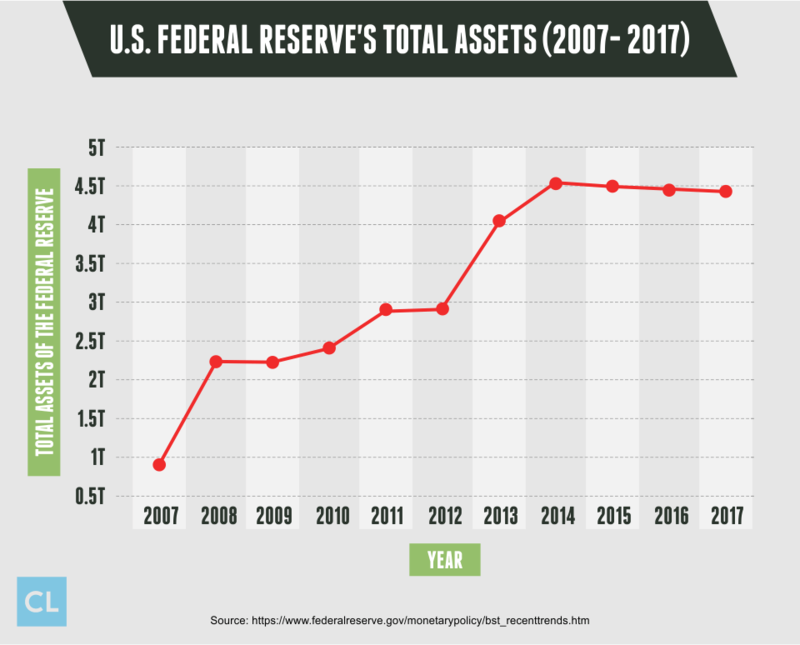 With a definite link to the data for the Fed's total assets, the amount of money other institutions have deposited has increased dramatically since the 2008 crisis. Gallup conducted polls among Americans to determine their opinions on the Fed and its performance in 2017, and the results indicate people either think it's doing just OK or have no opinion at all. 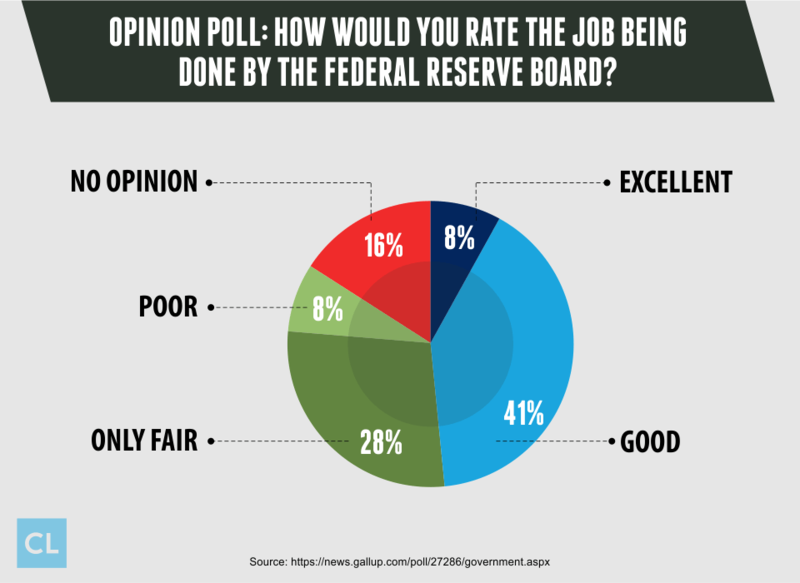 When asked the question "How would you rate the job being done by the Federal Reserve Board," only 8% of U.S. respondents thought it was performing "Excellent." 41% of the survey participants said they thought the Federal Reserve's Board was doing a "Good" job, while 28% said it was doing a job that was "Only Fair." 8% of Americans thought the Federal Reserve Board was doing a "Poor" job in 2017. But perhaps the most telling statistic was that 16% – one in six Americans – didn't have any opinion on the Fed's management. One in six Americans doesn't have any idea whether the Federal Reserve is doing a good job or not, which illustrates the Fed's ongoing issues with a lack of accountability and transparency. 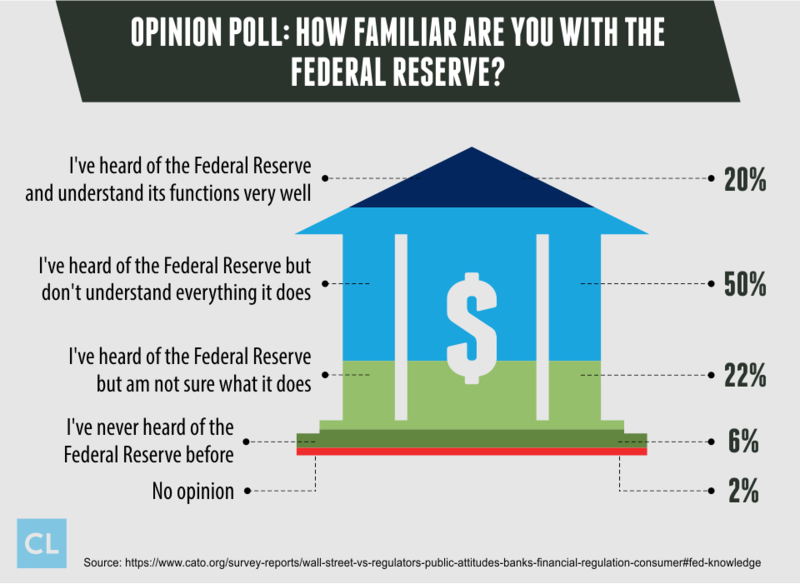 The fact is, data from a Cato Institute Survey in 2017 shows that exactly half (50%) of all Americans have heard of the Federal Reserve but don't understand everything it does. Another 22% of Americans have heard of it but don't understand anything about what it does. 6% have never even heard of it, and 2% don't have an opinion at all. Which means that among all Americans, only one in five (20%) know what the Federal Reserve is and believe they understand its function very well.